In this post we have discuss one more Web development tutorial by using PHP script with Ajax. Here we will learn how to fetch data from XML file and insert into Mysql database table by using simple PHP code with Ajax JQuery. In different terms we can also say how to import XML file data into Mysql table with PHP code with JQuery Ajax. We have already discuss many topic on how to import and export data from mysql to CSV, Excel, JSON using PHP script. But we have not cover this topic. 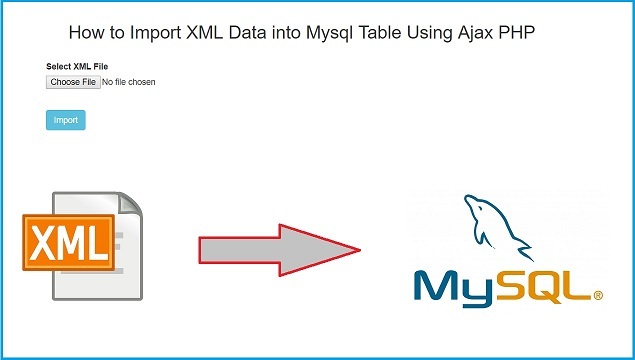 So, in this post we have make web tutorial on importing of XML data into Mysql table by using PHP Ajax and Jquery. We all know XML stands for extensible markup language and it is used for to save and transferred data on web and this data also not only readable to human but machine also. This type of data mainly used for transferred data from one web to another on internet and it is also compatible with any programming language. Define data in XML format is very easy and we want create node one by one to store data into this format and we can easily understand this type of data. So here we have see how XML data can be inserted into Msyql table. For Import or Insert XML file data into Msyql table, so we have make simple form for upload CSV file to server and here we have put validation for upload only xml file. After making form we want to submit XML file to server, so we have use Ajax request, so in Ajax we have use FormData() object for submit selected file to PHP script and in script it will validate file is selected or not and selected file XML or not. If selected file is XML then after we have use simplexml_load_file() PHP function, this function will convert selected XML file into Simple XML Element object. So from this object we can fetch data in our PHP by using loop and after this we will insert into Mysql table. So, this way we can Import or Insert XML file data into Mysql table by using PHP script with Ajax JQuery.